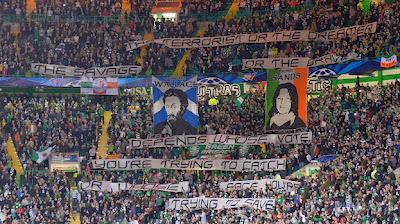 UEFA have opened disciplinary proceedings against Celtic for the display of an "illicit banner" during the Champions League match with AC Milan on Tuesday night. The governing body's Control and Disciplinary will deal with the case on December 11. 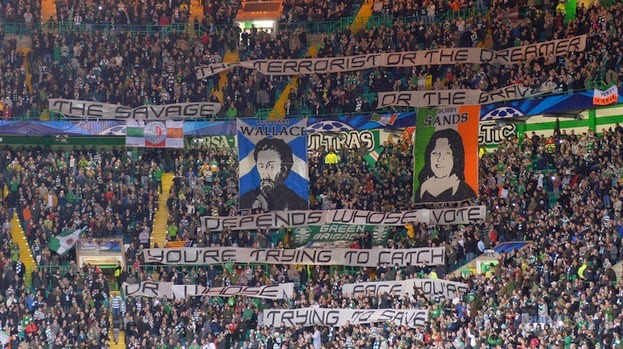 On the banner, unfurled before the match, images of William Wallace and Bobby Sands were shown alongside the message: "The terrorist or the dreamer? The savage or the brave? Depends whose vote you are trying to catch or whose face you are trying to save." UEFA's disciplinary code says clubs may be subject to disciplinary measures if supporters are found to have used "gestures, words, objects or any other means to transmit any message that is not fit for a sports event, particularly messages that are of a political, ideological, religious, offensive or provocative nature". The governing body told STV: "Disciplinary proceedings have been opened against Celtic FC for an incident of non-sporting nature at their UEFA Champions League match with AC Milan." Celtic were fined £4,221 earlier in the season by UEFA after fireworks were set off by supporters during their Champions League qualifier with Cliftonville. The club's fans also caused them to be fined twice during their Europa League campaign in the 2011/12 season. In March 2012, UEFA fined Celtic £21,000 after supporters displayed an offensive banner and set off flares during an away game with Udinese. Celtic were also fined £13,000 for "illicit chanting" in the same competition during a match with Rennes. Police Scotland are also investigating after a laser pointer was allegedly used on AC Milan goalkeeper Christian Abbiati during Tuesday's match. Although UEFA rules allow for action to be taken on such a case, the governing body have not stated they will act.